For the last year, my breakfast of choice has been muffins. I find them filling, versatile, cheap, easy to store, and even easier to eat on the go. A few weeks back, sweet muffins and I had a falling out and we needed some time apart. Mostly it was that every muffin began to taste the same so I wanted to make the switch to savory for a change. 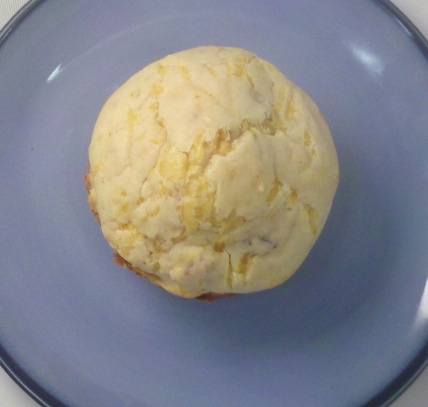 Enter Bacon and Cheddar Muffins, adopted from nestMeg. Bacon and cheese in muffin form? Yup, these are a definite make again. Cook bacon using your preferred method and let it cool a bit. Optionally, save some leftover bacon grease, and use it to replace some of the butter or to grease your muffin tins. Preheat oven to 350. Prepare your monster sized muffin tins. Don't waste your time with the regular sized muffins on this one. 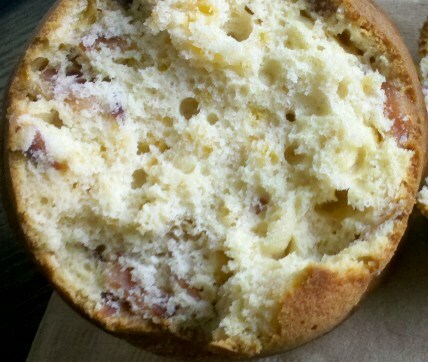 You know you want to eat a big muffin full of bacon and cheese. In one bowl, combine the first five ingredients (the dry ingredients). In another bowl, combine milk, butter, and egg. Combine both bowls and then add the bacon and cheddar. Mix just enough so that the ingredients will be well distributed in your muffins. Fill your muffins about 3/4 full and bake for about 15 minutes or until a toothpick comes out clean. Let it cool a bit and chow down. I made 8 large muffins with this recipe.